While Microsoft's Windows is the dominating OS in the world of computing, Android and iOS are the key players when it comes to smartphones and tablets or iPads. Microsoft tried its best, but failed in its attempt to gain a foothold in the phone OS industry too, as evidenced by the Nokia Lumia phones. As such, Microsoft has now started a different and new strategy. It has started pushing consumers in both the Android and iOS camps to install their apps for their respective OS. And with this strategy, they have introduced their Digital Assistant Cortana to be used in Android phones. Users can also replace Google Assistant/Google Now (whichever they use) with Microsoft's Cortana digital assistant. To get Cortana, you need to have the app "Cortana for Android". 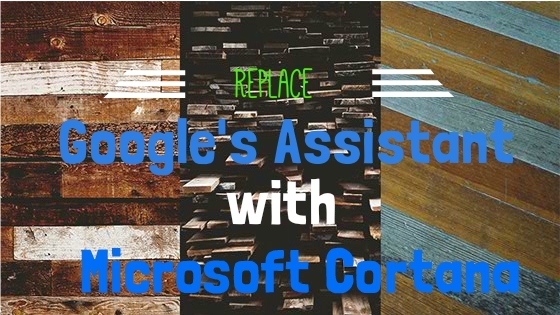 The latest update (update 2.8.0) of the app provides you with the ability to replace Google AI assistant with that of Microsoft's. The app will show you the process of adjusting the requirements to get Cortana to come up when you hold down the "home" button. When you launch the app for the first time, it will give you the option of setting Cortana as the default assistant for your phone. If you press in affirmative, the app will direct to your settings menu, from where you can make it your default digital assistant. But does Cortana fall short of the Google Assistant? Technically, yes. Till now, that is. The reason behind that is, you can't launch Cortana using a Voice Command like you can do with Google's AI assistant. Possibly this needs hardware integration, which Microsoft can not provide as of this moment. Also, the Cortana for Android app does not work in Landscape mode as of now. But if you are an avid Windows 10 user, then you may as well give it a shot as Cortana's AI is at par with that of Google's. Plus, if you use Cortana on other PC, or laptops, then the Cortana on your phone remains just as knowledgable as that you use everyday. This feature is a bonus that the Microsoft Cortana has over its Google counterpart and may very well be worth a try!